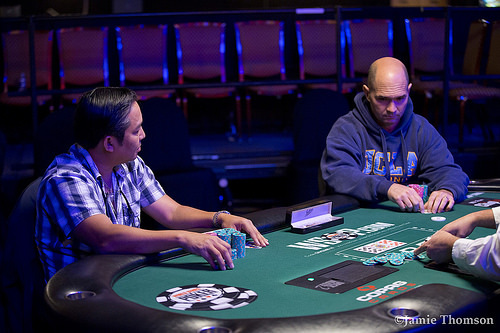 Danny Lee has been getting the best of it in the heads-up portion of Event #22. In the past few hands, both Le and Farnsworth took down pots with small two pair and are sitting at 3,500,000 (Le) and 1,400,000 (Farnsworth). Le opens with a raise and Farnsworth calls. The flop comes and both players check. The turn is the and Farnsworth bets. Le calls. The river is the and Farnsworth bets, Le raises, and Farnsworth three-bets. Le calls and Farnsworth shows for a pair and wins the pot.